Thanks to my trusty iPhone (thank you Josh for making me get rid of the rinky dink phone), I made it to Sugar Land quickly and safely. After a quick barbecue lunch, I checked into my hotel and got ready for the Wedding Festivities. I took my time getting ready...taking extra care in making sure my hair looked nice, my makeup looked great, and making sure I smelled like a fresh flower. As I was about to put my dress on, I gave it a quick shake and noticed a funky smell. As I put my dress over my head, I noticed it again! EEK! I gave my dress a big whiff....and HOLY MOLY it SMELLED HORRIBLE!!!!! To give you some smell-a-vision, the best way I can describe the smell is like a sweaty football player who hasn't showered in a week and who has only subsisted on a diet of onions and garlic. YOWZA BAD! I had just gotten the dressed dry cleaned, and my only conclusion is they used WAY too much solution on the delicate material. There was nothing I could do though. It was the only dress I brought, and since I had taken such a long time to get ready it was already time to go! I sprayed my dress with about a gallon of perfume and headed to the wedding! The wedding was held at a gorgeous venue that had the chapel and reception area all onsite. I am friends with both the Bride and the Groom so I couldn't wait for the ceremony to get started. Alisa looked absolutely stunning, and during the ceremony, I teared up multiple times when they were reciting their vows. They both have so much love for one another, and it was apparent through out the wedding. I got to be right up front and witness all of their little private moments like whispering I love you to one another when a verse was read and all of their loving gestures! 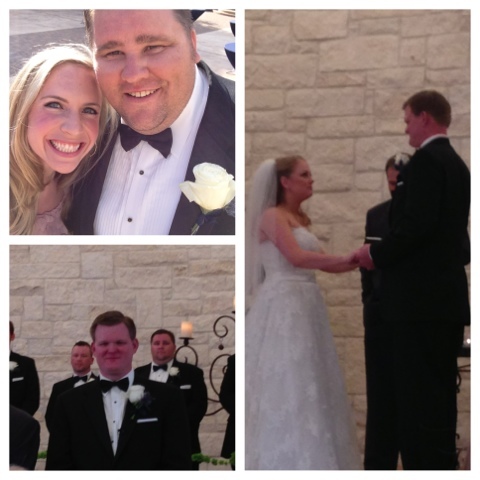 Luke and me before the ceremony, Keith tearing up as Alisa walked down the aisle, and the couple reciting their vows! Everyone cheered when Keith kissed his bride, and then the party got started. We drank, we ate, we danced, and we had a blast, and when I say ate, boy did I ever. Their food was hands down, without a doubt, the best food I have EVER had at a wedding. We had stuffed chicken and beef tenderloin that was cooked to perfection, and if I hadn't been saving room for cake I would had thirds. Luke caught the bouquet!!! 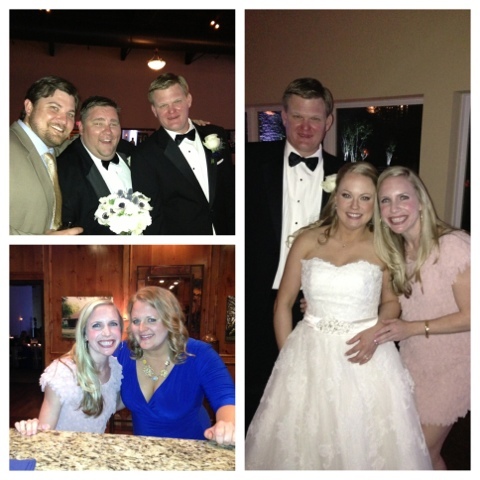 ; Katie and Me; and the Happy Couple! Doesn't Alisa look stunning? At about 11pm, the newlyweds got into a limo and drove off into the night. Nobody wanted the night to end so we went out at a local bar near our hotel. We kept the party going till the bar closed and then I made Luke drive a few of us to Whataburger. I had yet to try the new spicy ketchup, and I was not going back to DC without having that Texas goodness. It was just as good as I imagined it/is anything better than Whataburger at 3am? 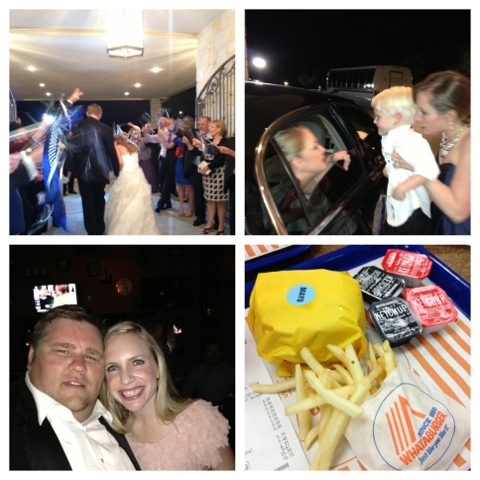 Heading to the limo, one more kiss for sweet Mason, Luke and me at the after party, and my Whataburger!!! Actually there is something better than Whataburger at 3am...and that thing is drinking a Whataburger Chocolate Shake in my hotel room bathtub. Haha...which is how I ended my crazy night. I had been ready to re-bathe since I put on my rank dress. Hopefully no one else at the wedding could smell my putrid dress me, and if you could I apologize. I blame my dry cleaners. 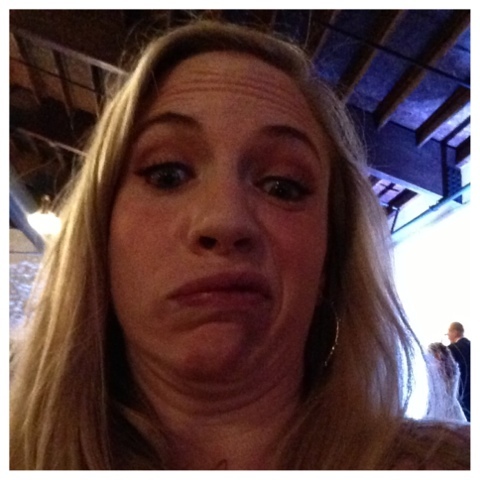 My reaction to how my dress smelled at the wedding! After my bath and my shake, I hopped into bed and passed out. The next morning I was definitely feeling my night of excess. Oy! A headache from drinking. A stomachache from overeating. Foot pain from dancing. It was all WORTH IT!!! 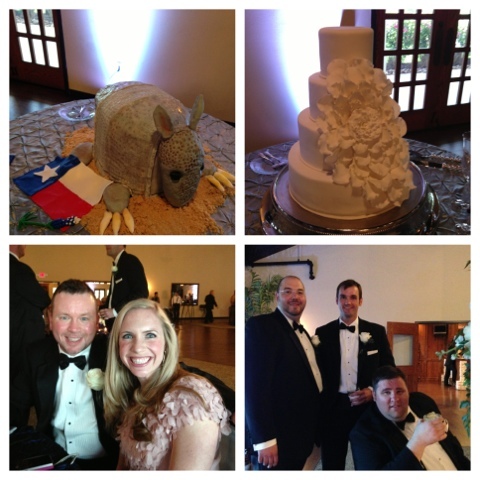 I had so much fun partaking in Keith and Alisa's special day. They are such a wonderful couple, and I love them with all my heart. I know they will have a lifetime of happiness, and I cannot wait to be a part of that as well.